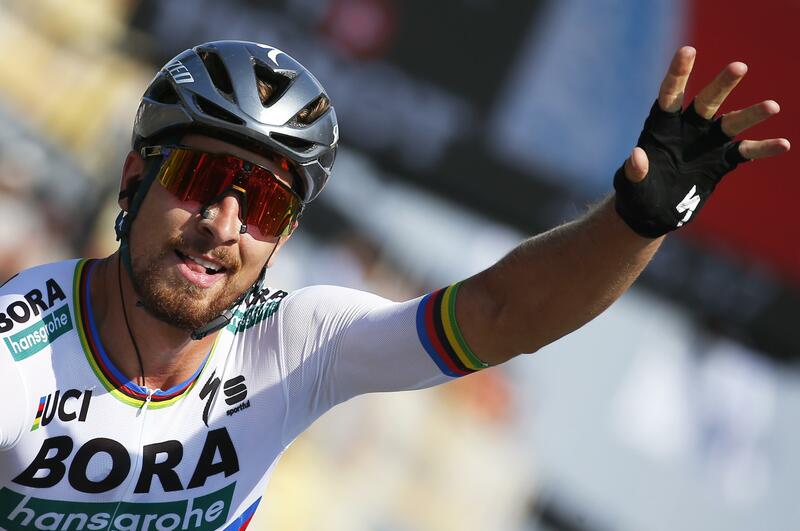 Sun., July 8, 2018, 9:08 p.m.
LA ROCHE-SUR-YON, France – A year after leaving the Tour de France in disgrace, Peter Sagan earned the race’s yellow jersey on Sunday after doing what he does best: Powering past the competition to reach the finish line. The three-time defending world champion took the overall lead of the Tour on Sunday after he bettered about a dozen other sprinters to win Stage 2. The Slovakian rider’s ninth career win at the Tour came just over a year since he was disqualified from cycling’s most prestigious event by race officials who ruled he had caused a crash that broke Mark Cavendish’s shoulder. Sagan, however, said there was no revenge factor in mind, and that just wearing yellow was reason enough to celebrate. Defending champion Chris Froome, who fell into a ditch near the end of Saturday’s Stage 1, arrived safely with most of the peloton. Sagan came up short in the opening stage’s sprint when he crossed second behind Fernando Gaviria, who won on his Tour debut. And the second stage looked like it would feature another duel between the veteran Sagan and new star Gaviria. But Gaviria was involved in a group pileup inside the three-kilometer zone that neutralizes the impact of accidents and could do nothing to stop Sagan from claiming a six-second overall lead. Sagan moved to the front of the small bunch hunting for position, reaching a speed of 57.6 kph on the final 500 meters on his way to the finish line. With Sonny Colbrelli about to catch him, Sagan thrust forward to ensure victory. Sagan won the mostly flat 182.5-kilometer (113.4-mile) leg from Mouilleron-Saint-Germain to the department capital of La Roche-sur-Yon in 4 hours, 6 minutes, 37 seconds. Froome is 1:07 behind Sagan’s leading time as he pursues a fifth Tour title. Despite being cleared of doping allegations on Monday, some skeptical fans have jeered the Kenyan-born British rider since his Sky team arrived in France. Published: July 8, 2018, 9:08 p.m.